Born in Worcester, MA, 1941, Bruce Backman Turner became interested in art early in life through the influence of his late father, who had studied at the Columbia School of Art in New York City. On frequent family visits to the coast, he became intrigued not only with the majesty of the sea, but with the shimmering effects of light upon its surface. In 1972, Turner and his young family moved to Rockport, a small coastal community on Massachusetts North Shore, where he established a studio and gallery to paint and realize his life passion. Living and working along the New England shores, he could experience the full vitality of the sea with its powerful atmospheric changes that would challenge the artist's brush. Later, the intricately winding village streets, local quarries and peaceful harbor settings of Cape Ann became interesting subjects of his paintings. In 1979 he was among selected art instructors whose articles were published in American Artist Magazine, and was featured in Grumbacher's Palette Talk in 1983 and 1990. 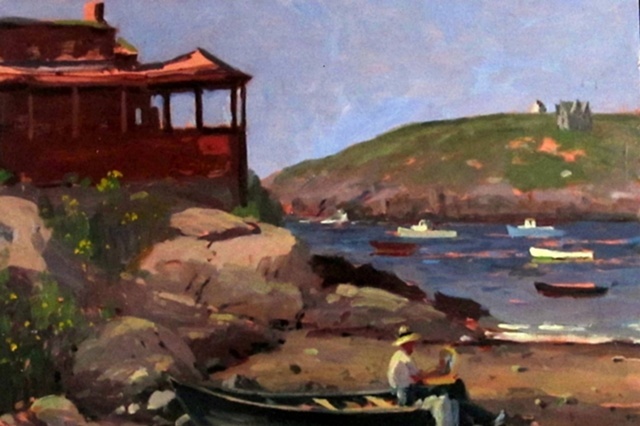 Listed in Whos Who in American Art, his work has also appeared in Monhegan  The Artists' Island, The Best of Oil Painting, Portrait Impressions, and A Gallery of Marine Art. Some of the exhibitions in which Turner's paintings have been represented are the Mary Bryan Memorial Gallery, Butler Institute of American Art, The Salmagundi Club, Academic Artist Association at the Springfield Museum, Marietta College's International Exhibitions, American Artists' Professional League, Hudson Valley Art Association, Chautauqua Art Association, The Maritime Gallery at Mystic Seaport, Ogunquit Art Center, North Shore Arts Association, Rockport Art Association, and the American Fortnight Exhibition in Hong Kong, where paintings by invited American artists were shown in 1975. Throughout the years, Turners work has brought him numerous national and regional awards including the prestigious Louis E. Seley Purchase Prize for first place in the Salmagundi Club's annual oil exhibition. In addition to maintaining his Rockport studio and gallery for the past 41 years, Turner has served on several art juries as well as on the Board of Directors for the Rockport Art Association and the North Shore Arts Association. He has conducted workshops throughout the years and has been invited by numerous art organizations to lecture and demonstrate his approach to painting. While continuing to enjoy the inspiration of the beaches on Cape Ann, Turner has traveled and painted from across America to the canals of Venice, Italy and the countryside of Alsace, France. His work is included in such public collections as the Sloan-Kettering Cancer Center in NYC, Massachusetts General Hospital in Boston, the 4H National Headquarters in Washington, DC, the MBNA corporate collection, The Pickett Collection - Carol Woods Center, Chapel Hill, NC and in private collections throughout the US, in Canada, England, France, Belgium, Sweden, Saudi Arabia, and Australia.